We're finally starting to see some real snow now, and I'm loving every minute of it. It's supposed to snow again tonight and all through tomorrow--with a final snowfall of 7-9inches. I can't wait! Of course, I'm not the one who ends up shoveling the driveway and our corner-lot sidewalk. For lighter snowfalls, Tom shovels everything himself, but I have a feeling we're going to need the snowblower for the nor'easter that's on it's way. They're predicting snowfall of about an inch an hour. The boys had fun "helping" Tom this past weekend during the first big storm of the year. 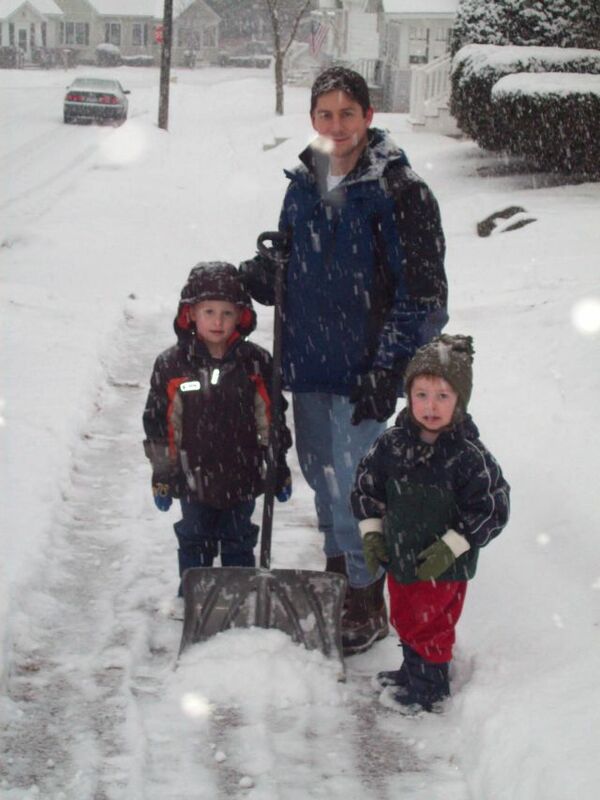 It took me almost as long as it took Tom to shovel the entire sidewalk to get them in their snowsuits and boots. And they still haven't figured out the concept of mittens. Just putting mittens on can take a half hour. I'm looking forward to the day when leaving the house isn't such an undertaking. I wasn't sure what winter in NY would mean, but so far it hasn't been too bad. The worst part about it is 1)the fact that it takes half an hour to leave the house/get back in the house because of all the hats, gloves, coats, snowpants, and boots we have to put on/remove (and please god, don't anybody need to come back in to go to the bathroom because then the ordeal starts all over again! ), 2) the slushy, snowy mess that comes in on aforementioned boots (and dog paws), and 3) having to put on boots/coat/gloves, trudge through the snow to the woodshed, and carry huge loads of wood across the yard on a daily basis. I miss out attached two-car garage, and I miss being able to skip merrily from the house December through February, unencumbered by winter paraphernalia. But that's all. I get as giddy and excited when snow is in the forecast as I did when I was a little girl. I can't sleep, and just sit staring out the window, waiting for it to start. And we get real snow here, and it stays, but the roads get plowed. So you can play in it and drive. The best of both worlds. ﻿The park near our house has an awesome sledding hill. There's a "baby" side, where the hill has a nice slow grade to it, perfect for little kids, and there's a "big" side, with a nice steep hill, and a natural platform perfect for getting some air. 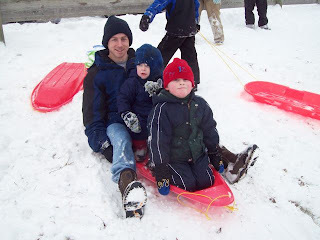 The boys had a blast and proved themselves quite the little daredevils. Sam and John graduated to the big side quickly, and loved getting airborne. (Mommy enjoyed it too!) But not quite as much as the grandmother, sledding the "big" side, too. I hope I'm still sledding when I'm a grandmother. love this - especially the bit about getting ready in the morning. During the Big Snow here in Dublin, I had to get up 15 minutes earlier every morning so we could factor in hte extended doorway routine... hats, scarves, gloves, boots. Our car got snowed in and we couldn't drive anywhre which was kinda nice... lots of warm fires and cosy hot chocolates. That said - I am hanging out for Spring!